Arcade enthusiasts will no doubt remember the coin-op Gradius, a modernized version of the old Atari title Defender. 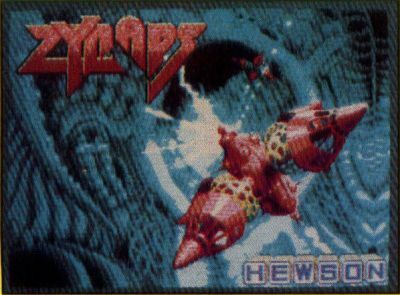 Zynaps, a similar game just in from the U.K., takes up where these other horizontally scrolling blastathons left off and places the gamer in the position of a Scorpion fighter pilot who must knock out an alien space station, a la Star Wars. An unusually large status panel occupies the lower quarter of the screen. Unfortunately, the manual does not identify the indicators very well. Oh, it tells you what each means. It just doesn't tell you which one is which—standard procedure for most overseas titles, where the philosophy is to let the players figure out the games on their own. The upper three-quarters of the screen is where all the action takes place. 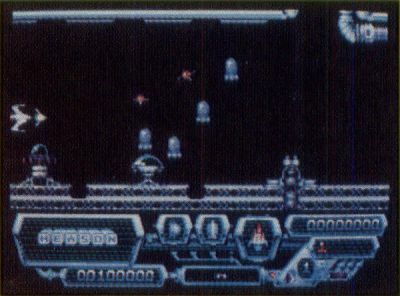 A player's up and down movements are severely limited in such a compressed action area, especially since contact with any of the space station's installations is instant death. However, that isn't a complaint; this limited movement actually adds to the overall feeling of the game. Only joysticks are permitted as input devices. This is preferable to using the mouse anyway, since the mouse is an expensive input device that would receive much wear and tear from Zynaps. One-or two-player options are available, but the players must alternate turns during a two-player contest. The button fires the established weapons systems, as well as activating the "fuel scoop." After destroying a wave of attacking aliens with your lasers, an animated fuel icon appears. Fuel is collected by passing over the icon. After enough fuel has been obtained, passing over the next fuel icon with the fire button held down will activate the new weapons system, which is added to the arsenal and does not void previous systems. This makes higher levels somewhat easier to navigate compared to the first few screens, since adding plasma bombs, homing/seeking missiles, etc., improves your ship's destructive potential exponentially. However, losing your life causes loss of all weapons systems except lasers. I'm glad to note, though, that losing a life does not put the player all the way back to the beginning screen. You are able to keep going from the level in which your life was lost. Zynaps boots up into a nicely rendered title screen, accompanied by an interesting musical sound track. When play has begun, the music is thankfully replaced by realistic sound effects. The space station is drawn artistically. The attackers are multicolored, fully animated sprites, but they move in mindless, repetitive patterns, just like their coin-op predecessors. However, they do have the ability to drop mines in the player's path. Contact with a mine is obviously deadly, but while they cannot be destroyed, they can be avoided. Ground-based installations fire semi-smart missiles into the action area that cannot be destroyed, but can be avoided. These will automatically detonate after a short period of time. After obtaining plasma bombs, these ground-based installations can be destroyed much easier than with lasers alone. Alien command/mother ships will present an additional challenge during higher levels of play. While the variety of alien attackers seems somewhat limited, game play is so frantic and addicting that a player will not notice. Zynaps is a good buy.